Be wary of small choking hazards – Board game piece and hard candies are eye-catching. Think about placing duct tape over battery covers on things like remote controls. Put away the hazardous materials – Cleaning products, medications, and toiletries are some of the toxic things found in your home. These are especially dangerous for your little ones, so make sure they’re stored somewhere that your kids can’t reach, and in a childproof container. 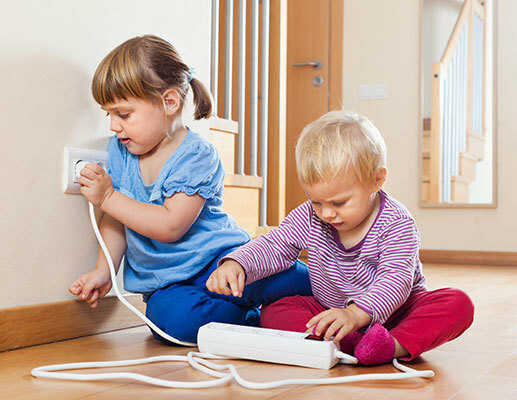 Cover electrical outlets – Toddlers have little fingers and a lot of curiosity. Invest in some cheap plastic outlet covers, and hide any loose wires that could be “played” with or tripped on. Lock your guns – Clear it, check it, lock it. If you have guns or other self-defense tools (TASER device, knife, stun gun) in your home, make sure they’re unloaded and in a safe, locked location. All ammo should be kept in a separate locked location as well. Secure heavy items – Over the last 10 years, a child visits the emergency room every 45 minutes for injuries involving fallen TVs in the United States. Make sure your television and other large items (bookshelves, mounted mirrors, etc.) are secured, stable and safe. Fence the pool – Installing a fence around your pool keeps your kids out, and helps give you piece of mind when spending time in the yard. Make sure it’s at least 4 feet high and has a self-closing and self-locking gate. Depending on your state, it may be a legal requirement! Communicate – Prevention is key when it comes to your child’s safety in your home, but nothing beats communication. Be open about the dangers of different things around the house, making sure to stress that it’s for their protection. Creating a safety game or song can be a great way to help your kids enjoy learning about safe habits, and remember them as well. Have a tip that we missed? Let us know! Sound off on Facebook and follow us on Instagram!